There is a theory, for which there is very little literature even on the internet, that there are seven look alikes for every person on earth.I do not know how much truth there is in this theory. However,I do know that people have uncanny resemblances to completely unknown people. I vividly recall this instance when I was boarding the aircraft to Singapore.The person behind me tapped me on the shoulder and said " Hi, are you Bharat?" I was surprised as I did not recollect seeing him ever before. When I acknowledged that I was Bharat but professed ignorance about who he was - he said "I was your classmate in Bishop Cotton school". Since I had never studied in Bishop Cotton school, I told him that and moved on to board the aircraft. However, it did seem a little uncanny that someone mistook me for someone else with the same name. Some year earlier,I saw the photograph of my brother's friend. I mistook this photo to mine - he looked so uncannily like me.Other than his sartorial style which was quite different,I could still mistake him to be me. Deven Verma is on the left. This well known cinema actor is seen with the late Sanjeev Kumar in this image. 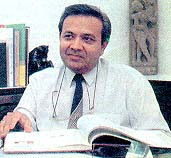 This is (image above) Dr. Prakash Kothari. Notice how similar he looks to Deven Verma,above? 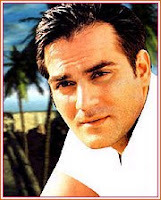 This is a photo of the actor Arbaaz Khan. This is the Roger Federer.He looks like the fourth Khan after Salmaan Khan,Arbaaz Khan and Sohail Khan. Perhaps,like the internet is running out of static IP's - the DNA responsible for facial features is running out of permutations. Look alike or not, surely if the article mentions films it attracts many look alike filmy ads!